"I grew up at a Catholic Boys' School at the Bronx. Graduated to DeWitt Clinton High School. A year at Fordham University before I joined the force. Where did you go to high school, Harold?" The speaker is Detective Lieutenant Peter Nicholas (Tony Lo Bianco), but at this point, at the beginning of Larry Cohen's God Told Me To (aka Demon) all the focus is on his addressee, Harold Gorman (Sammy Williams), who is perched on a building-top water tower and has just shot dead, with eerie accuracy, a number of random New Yorkers in the streets below. It is only after Harold has calmly explained his outrage with the words "God told me to" and leapt to his death that the film refocuses its attention on Peter - and now that brief introductory bio which Peter had given to Harold, expressly as a measure to humanise himself in the eyes of a killer ("I want you to know me. We don't kill people we know, do we, Harold? Only strangers. That's why I'm coming up, Harold, so you can see my face. "), starts to resonate with the film's key themes of faith in crisis. Peter had even told Harold sadly, "We can't bring anybody back to life - nobody can," - suggesting his own conflicted attitude to the central tenets of his Christian upbringing. Make no mistake about it, devout Peter is tormented by his Catholicism. He sneaks off daily to Mass without telling his girlfriend Casey (Deborah Raffin), and blames his childless ex-wife Martha (Sandy Dennis) for refusing to formalise their separation when really he is the one opposed to divorce. 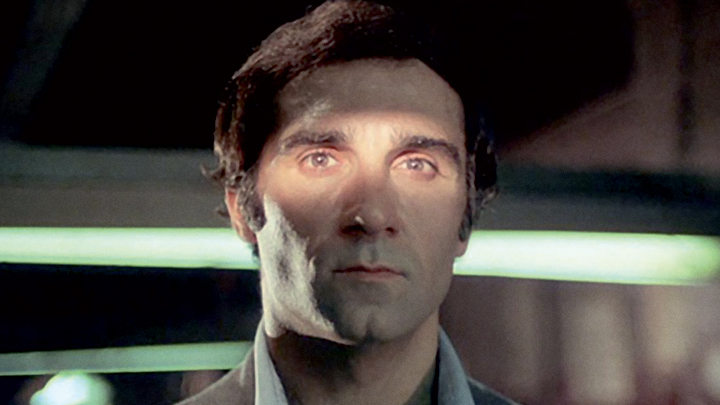 As more people go on killing sprees (including Andy Kaufman, in his onscreen debut as a policeman), and all, like Harold, blame their deeds on God, Peter finds the Biblical conflicts of good and evil taking on a terrestrial - and extra-terrestrial - form, with himself and his ethical choices crucial to the unfolding passion play. Cohen's film, like William Friedkin's The Exorcist (1973) before it and Richard Donner's The Omen (1976) and Giulio Paradisi's The Visitor (1979) after it, is a retelling of Abrahamic myth and morality through a genre frame. Here the machinery of divine intervention is taken for a freaky secular spin via the familiar cinematic modes of urban realism and even science fiction, and a detective mystery becomes a mystery rite. God Told Me To is an earnest yet crazy tale of alien abductions and virgin births, of hermaphrodites and drones, of a fallen angel and a rising redeemer, of Satanic temptation and Christ-like self-sacrifice. Here a man of God partners up with a science journalist to help spread the good word, and a cabal of worldly business leaders makes deals with the devil. From this contradictory matrix of ideas emerges an intelligent discourse on the problem of evil and the place of faith (and the mythological frameworks of faith) in our modern world. Instead of offering easy answers, Cohen retells his ancient story - with contemporary embellishments - as a question mark for the viewer, offering us a free choice of rational, supernatural and religious routes through its strange narrative trajectory. For whether this is the tale of a new New Testament, or of a potential planetary takeover, of an individual's mental breakdown, remains tantalisingly unresolved. All we have is orphan Peter, who grew up at a Catholic Boys' School, and is, in investigating a spate of awful, perhaps connected cases, brought face to face with the stranger within himself.